When the Great Flood of 2009 came through last Sept, one of the storage bins hardest hit was holding our Christmas things. I’m grateful that my husband’s vintage, 1950s artificial tree he inherited from his grandparents survived, as did more than half of our ornaments, but some of our keepsakes and all the stockings were ruined–not only did they get wet, but the red dye from innumerable ribbons had stained them beyond saving. The worst part is that many of them were handmade by my grandmother: cross-stitched from patterns she picked out for each of us specifically. Now, they weren’t necessarily patterns I might’ve picked out myself, but the love that went into each one was apparent, and made them really special to us. 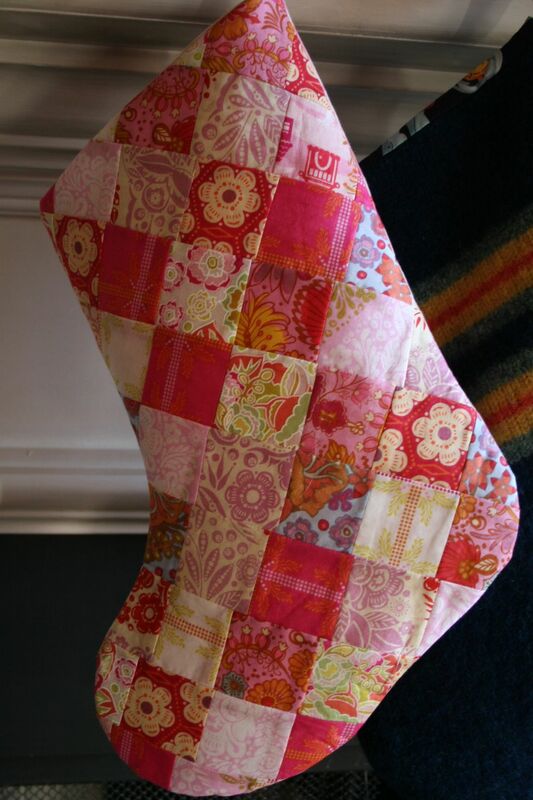 For Miss M, a pink and honey voile confection from Anna Maria’s Little Folks Sugar Cookie color palette. She adores it, and it was stuffed to overflowing on Christmas morning. For O, our little man, a wool athletic sweater, felted and stitched back together. Lining is Alexander Henry’s Ready, Set, Robot! and is so perfect for our guy! 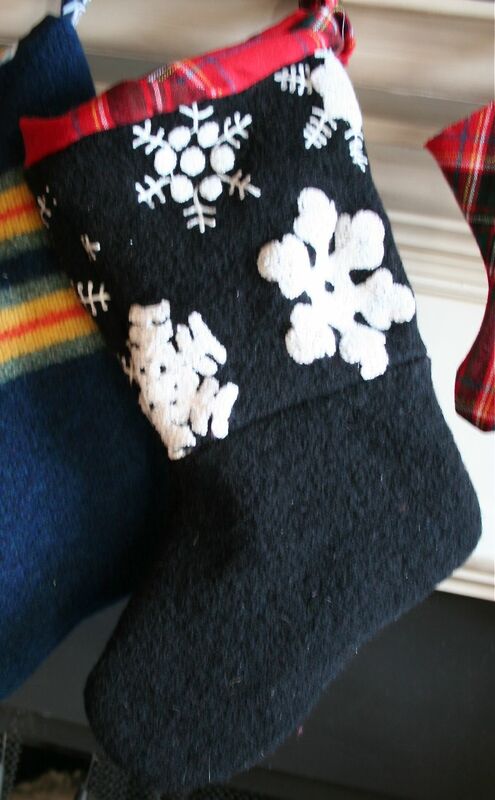 For our oldest, E, a special request: “Mom, can my new stocking be black?” Um, OK. A boiled wool jacket, pieced together to make the right dimensions, and topped with a twisted fringe of Christmas plaid. Lined in the same plaid, she thought it was just right–if only I’d really added those skull beads, like she wanted. And finally, this teeny one. No, not for the dog. For the New Baby. 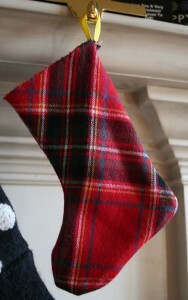 You heard me: we’re expecting #4 in early May, and thought we’d go ahead and put up an anticipatory stocking this year! We’re as surprised as you are, trust me, but having another teensy stocking on the mantel has made it all the more real to us, and we’re already super excited to meet this new addition once the weather warms up. 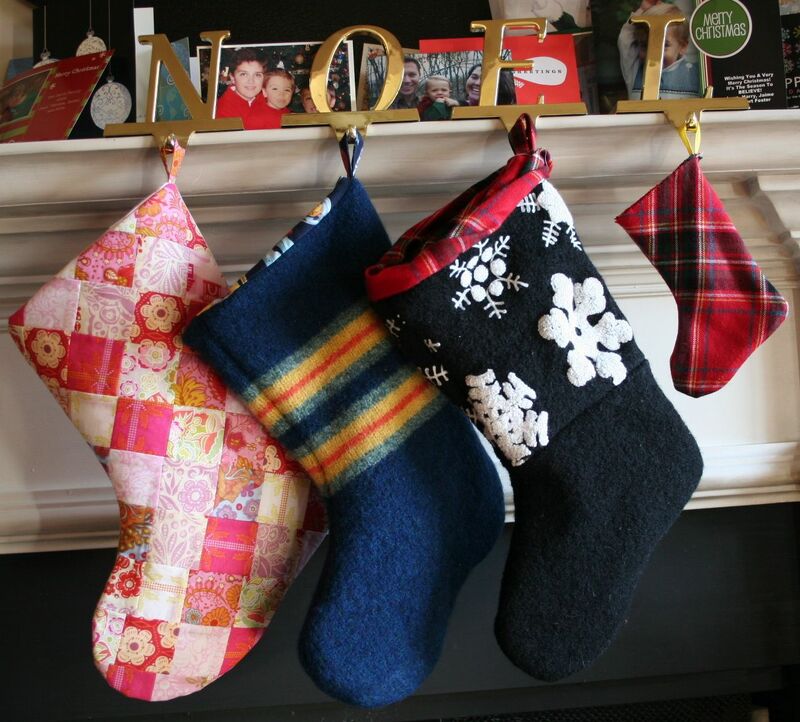 Next time: Mom and Dad’s stockings, which were a little trickier… In the meantime, anyone know a Christmas word with 6 letters? 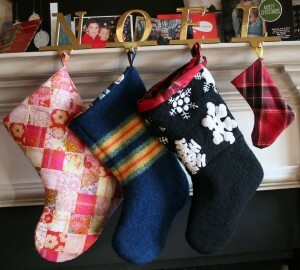 I’m thinking next year, “Noel” won’t have enough hooks. ← Gift Certificates Still Available! @Antoinette: Ooh, PEACE might work for us… I was wondering if we should keep NOEL and add JOY, maybe? Then there’d be room for the dog (or if we get another sudden surprise). Thanks for the congrats! love love LOVE the new blog layout! Fabulous. and GREAT stockings! Perfect announcement for the little one. I’m still in shock that you’re having #4. I need to get working on #3 now…. @dana: We’re still a little surprised by it all! Thanks for the congrats–am still working on a big blog redesign, with all kinds of new buttons and features. Can’t wait to unveil it all! 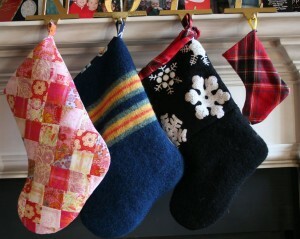 Thanks for all the stocking inspiration, by the way–I was working under pressure, and can only hope mine measure up! You will love this theme! I just moved Fabric Shopper over to wordpress and am using this as well. Just do not upgrade to 2.9. It is really buggy! Thanks! I already did the upgrade–looks like I might regret it! First time visiting your blog and I can’t wait to visit your shop! 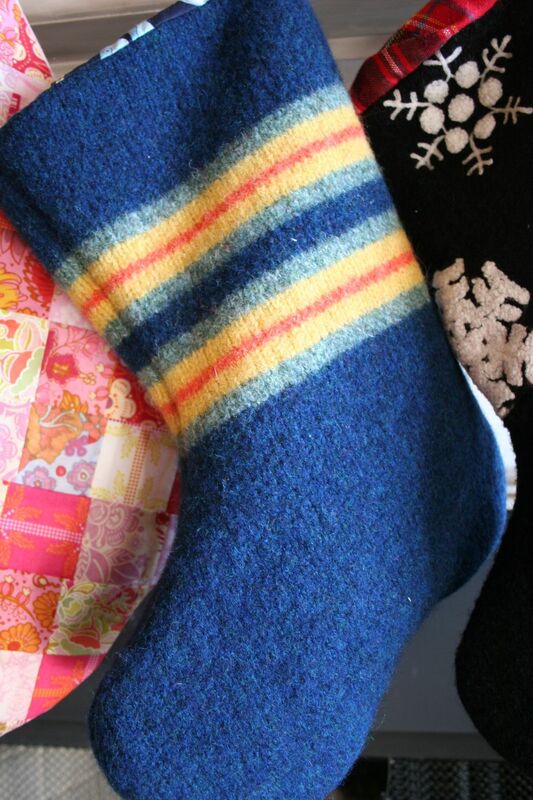 Just bouncing around from blog to blog tonight looking for cool, crafty goodness. : ) Congrats on the new little one. Maybe “HO HO HO” would work and the dog could have a “Merry Christmas” hanger at the end?